The patent specification describes a transparent glass building "meetings in the form of a cylinder in which each part is composed of a single glass giant". The description alone makes several lines for simple glass walls. Any part of the patent also refers to the ability of glass to withstand multiple "loads and forces" to maintain the rigidity of the monolith. 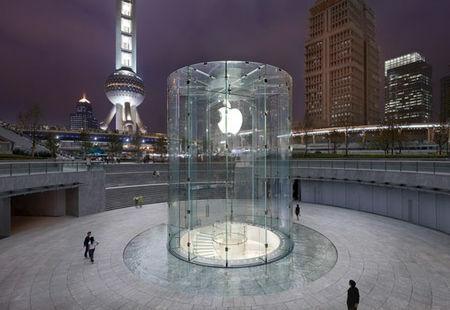 The Apple Store opened in Shanghai July 10, 2010 and adopts the shape of a cylinder, perfect figure in China. It draws on the store "square" New York, whose walls are also large panels of transparent glass.